NOTICE: When using Newline products pay close attention to the dilutions. 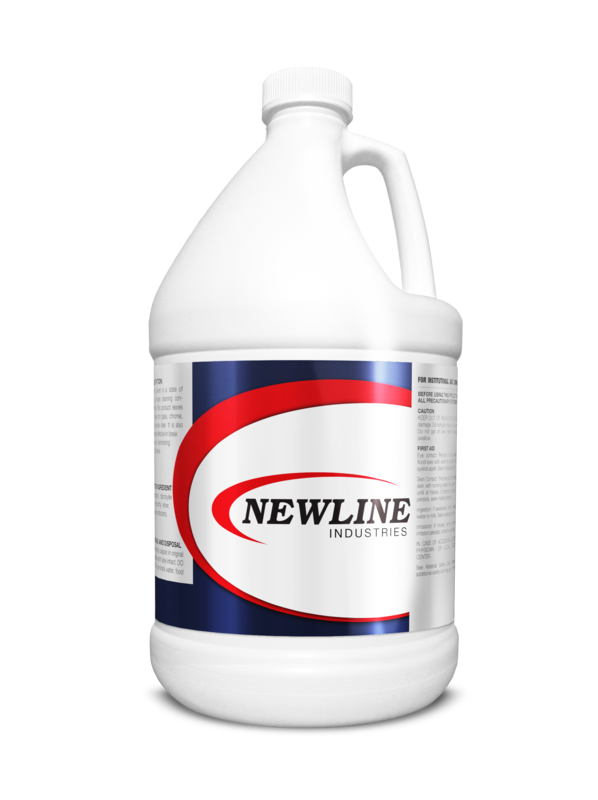 You will get more BANG for your BUCK with Newline products. Stain Free is premium organic stain remover. Stain Free is designed to alter the structure of stains by removing, oxidizing or making them completely disappear. It is ideal for use with mustard, furniture & wood stains, shoe polish, urine contamination, coffee, vomit pigments and other staining materials. 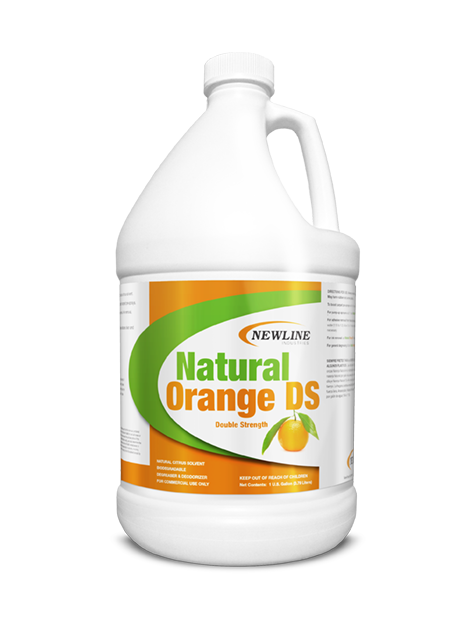 Natural Orange DS premium solvent booster, spotter and deodorizer is the bust buy in the industry. When you need to boost the power of your pre-spray add 4-6 ounces of Natural Orange DS and not only will you cut more grease and soil but also leave a fresh citrus fragrance behind! Pure TEC grade d’limonene Natural Orange DS is also great for the following:(adhesive remover, ink remover and general degreasing) 100% Biodegradable Natural Orange DS citrus solvent is a must for any cleaning contractor! Dead Red is a one part red stain remover that excels in the removal of food and beverage stains in synthetic carpets and fabrics. Dead Red alters the structure of stains by making them invisible. Children’s drinks, fruit juices and sports drink stains are no match for Dead Red’s cleaning ability. Dead Red is safe and effective on virtually any stain caused by a common household food or beverage spill. Dead Red is for use on synthetic carpet and fabrics only. Not recommended for natural fabrics. 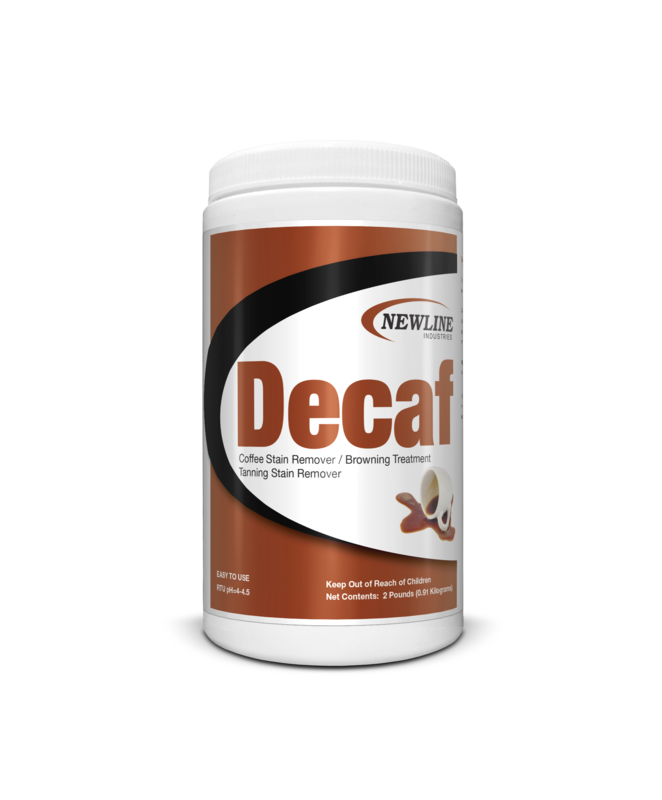 Decaf is formulated to remove pesky coffee and tea stains both old and new. Decaf works extremely well on removing cellulose browning that occurs on carpet and upholstery due to over-wetting and use of chemicals with extremely high alkalinity (pH). Browning is also known to happen when there is improper drying. New Energy is a semi-volatile and multi-purpose Olefin Carpet Pre-Spray, spotter and solvent booster. New Energy excels at emulsifying oils, waxes and tars from carpet fibers….especially Olefin! New Energy breaks the bond the oils form with Olefin fibers. New Energy’s super-concentrated formula greatly improves cleaning performance of traditional pre-sprays in a fast economical way. pHire (fire) is a high pH cleaner designed to attack the toughest soils on those impossible jobs. It can be used as a stand-alone cleaner, pre-spray booster, stripper booster and pressure washing solution. pHire contains the latest in surfactant technology, chelating ingredients and alkali builders. New O2 bleaches faster and removes all impurities through a oxidizing process. New O2 removes yellowing which can occur on synthetic carpet and upholstery. New O2 treats stubborn urine stains. New O2’s powerful oxidation process neutralizes odors. 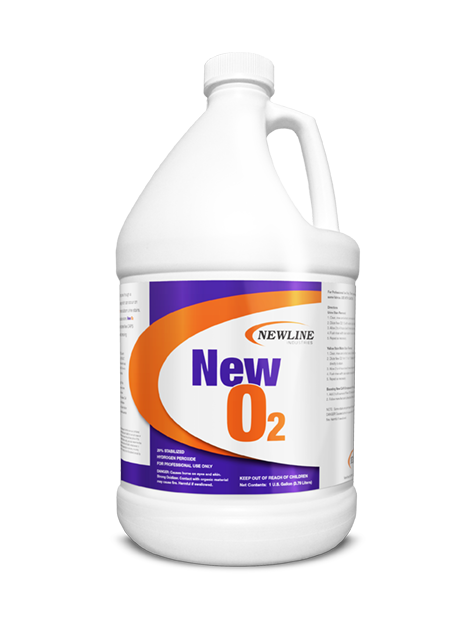 New O2 makes an excellent booster for Newline Industries New CAPS encapsulation cleaner. New O2 is excellent at removing water stains. New O2 is great when used as a Urine Stain Remover. New O2 is a 20% by volume Stabilized Hydrogen Peroxide. New O2 is a hazardous material and requires special shipping fee’s so expect to pay more for freight. Rust-D has a unique blend of surfactants making it the fastest acting rust remover on the market. This new generation rust spotter performs immediately when placed on the stain. Rust-D rinses easily after the stain is removed. PetZ is a chemical blend of living bacterial cultured enzymes and odor control agents. It will destroy the molecular structure of odor-producing materials. PetZ removes most odors created by pets and those on porous surfaces. 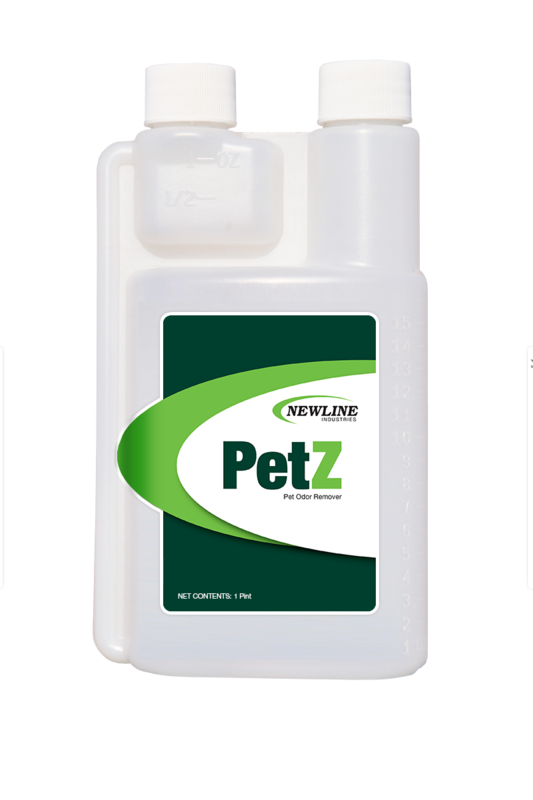 PetZ’s concentrated formula will produce 32 gallons of RTU urine treatment product and leave behind a great fragrance. PetZ is available in a “betix bottle” as shown or gallon. 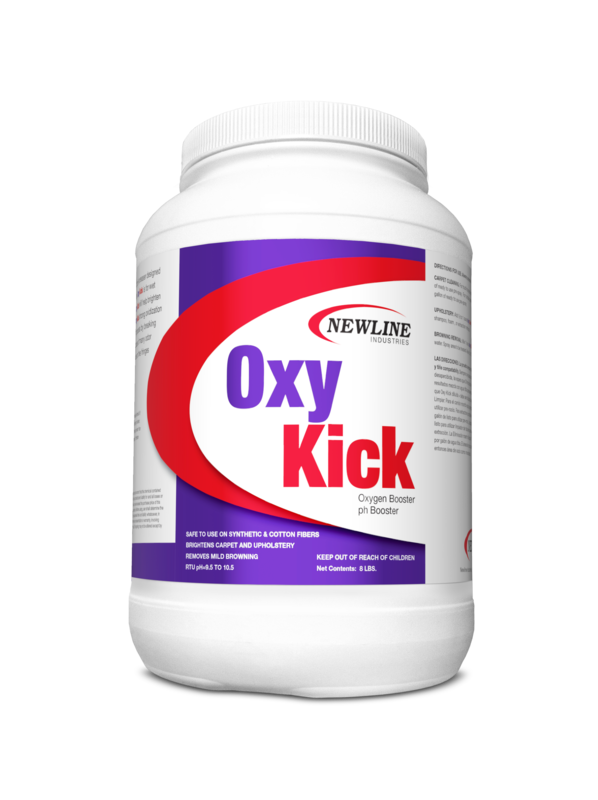 Oxy Kick is a oxygen booster and pH increaser designed to boost your RTU pre-sprays. Oxy Kick is a great addition to your solution for wet cleanable carpet and upholstery. Oxy Kick will help brighten dull dingy carpets and upholstery. Oxy Kick’s strong oxidization properties help in the deodorization process by breaking down organic matter which is the cause of many odor problems. Oxy Kick is excellent for use on the fringes of oriental rugs. Oxy Kick is great for use on Upholstery and also Browning removal. NEW Gel is formulated with natural orange oils to easily remove most oil-based spots and stains from almost any surface. NEW Gel emulsifiers allow you to rinse the spot away completely. Use NEW Gel on fabrics, including carpets and hard surfaces to remove the following; tar, asphalt, lipstick, grease, crayon, adhesives oil stains and gum. © 2018-19 Newline Industries. ALL RIGHTS RESERVED.